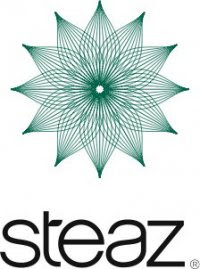 Steaz Organic Iced Teaz are the world's first fair-trade certified, all-natural, organic ready-to-drink teas. They come in tallboy cans or 64 oz bottles and are widely available at health food stores and Target locations across the country. They are also very easy to drink! 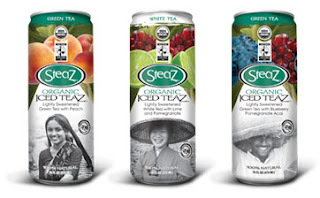 There are six flavors in the Steaz Organic Iced Teaz range, one unsweetened and five lightly sweetened. I got to sample three of the lightly sweetened flavors: Green Tea with Peach, White Tea with Lime and Pomegranate and Green Tea with Blueberry, Pomegranate and Acai. They were all delicious but I think my big favorite was the White Tea with Lime and Pomegranate. It has a crisp, refreshing taste that reminds me of summertime. I'm also dying to try the Lightly Sweetened Green Tea with Mint. 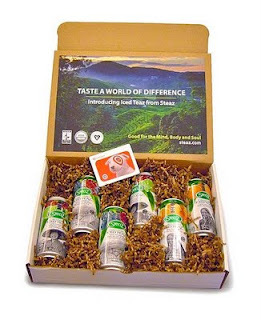 To enter and win a sampler pack of Steaz Organic Iced Teaz like the one pictured above, please comment on this post with your favorite flavor or something you learned from their website. Entries will be accepted through January 6th and I'll pick the winner using Random.org. US readers are eligible. My favorite would be green tea with peach. I think the green tea with peach sounds divine. Green tea has a subtle sharpness to it that I think the peach would balance out. The Green Tea w/ Mint sounds great! My favorite flavor is White Tea with Lime and Pomegranate :) *Thanks* for the giveaway! I think I would like the peach tea. My favorite flavor would be white tea with lime and pomegranate. I would like to try green tea with mint. My favorite flavor would be Green Tea:) I love it!! Please enter me. Thanks!! My favorite is Green Tea w/ Mint. Thanks! Green tea with mint is my favorite flavor.